Hiccup and Toothless are back on Blu-ray in an all-new double feature plus videogame combo pack this November! In an early announcement to retailers, DreamWorks says 'Dreamworks Dragons' will hit Blu-ray on November 15. 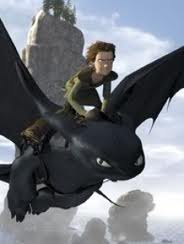 One of the best reviewed films of 2010, 'How To Train Your Dragon' enchanted audiences the world over with its captivating and original story boasting fire-breathing action, heroic deeds and heartfelt laughs. DreamWorks Animation’s new signature entertainment experience, 'Dreamworks Dragons' features two brand new adventures plus a Dragons online video game available for the first time ever. 'Dreamworks Dragons' includes the follow-up “Gift of the Night Fury,” in which the epic story of Hiccup and Toothless picks up where it left off and they take flight in a thrilling, all-new adventure to discover an island of never-before-seen dragons; the all-new “Book of Dragons” that reveals seven never-before-seen dragons as Hiccup, Astrid and Gobber share insider training secrets and new dragon mythology; AND a game card that grants exclusive access to the ultimate interactive Dragons challenge: a brand new Dragons Online Video Game in which players use the new training secrets they’ve learned to earn badges as they fight and train new dragons to become the ultimate dragon trainer. The Blu-ray will feature 1080p video, a Dolby TrueHD 7.1 soundtrack, and supplements will include: Deleted scenes, Gobber’s Training Secrets, Spot the Difference, Learn How to Draw a Baby Gronckle, World of DreamWorks Animation, and Previews. Blu-ray exclusives include: Gift of the Night Fury: The Animators’ Corner & Ultimate Book of Dragons. You can find the latest specs for 'Dreamworks Dragons' linked from our Blu-ray Release Schedule, where it's indexed under November 15.